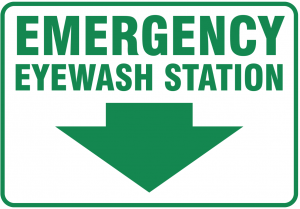 Did You Know You Need To Test Your Eye Wash Station Weekly To Meet OSHA/ANSI Standards? Compliance is an all-day, every-day requirement. 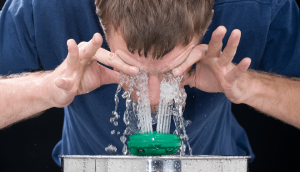 Emergency showers and eyewashes are required by the ANSI/ISEA Z358.1-2014 standard to be activated weekly, with a more thorough evaluation on an annual basis. 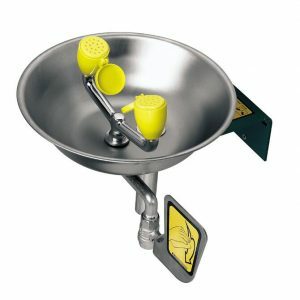 With OSHA fine increases of 80 percent having taken effect in August 2016, violations for inappropriate or inadequate eyewash and shower equipment have resulted in penalties of more than $100,000. 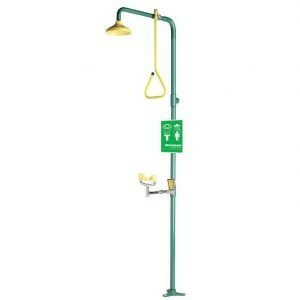 The standard guides the placement, functionality, and maintenance requirements for emergency showers and eyewashes. ANSI/ISEA Z358.1, in its current form, is the clearest and most useful tool for protecting workers from eye, face, and bodily injuries resulting from caustic and corrosive materials introduced by workplace incidents such as spills, splashes, and blown particulates. The standard requires stringent testing to be conducted on a regular basis to ensure properly functioning equipment is being provided at all times if an incident were to occur. We should all understand that compliance is not a once-a-year or once-a-month responsibility. Compliance is an all-day, every-day requirement. 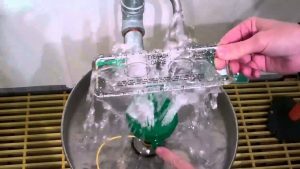 Accordingly, emergency showers and eyewashes are required by the ANSI/ISEA Z358.1-2014 standard to be activated weekly, with a more thorough evaluation on an annual basis. This requirement is established in Sections including 4.6.2, 4.6.5. 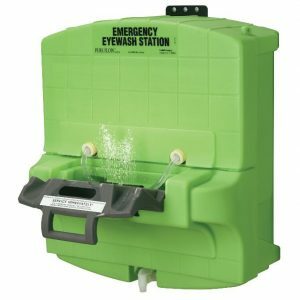 In practice, emergency response equipment such as eyewashes and showers sometimes fall to the wayside when it comes to maintenance, especially when prioritized against emergency preparedness equipment such as eye protection and fall protection. You should know that OSHA does not prioritize or take a backseat when it comes to providing adequate and properly functioning equipment, regardless whether the equipment aids pre- or post-incident. In addition to the above weekly minimum performance checklist required by ANSI/ISEA, it is recommended as a best practice to conduct additional weekly functional checks. The purpose of these additional checks is to fully ensure the equipment is operating correctly and is capable of providing proper first aid in the event of an emergency. As a general statement, all equipment needs to be inspected weekly to ensure that there is a flushing fluid supply and that the equipment is in good repair. If the equipment is of a plumbed design, then it should also be activated weekly to clear the supply line of any sediment buildup and to minimize any microbial contamination due to stagnant water. Self-contained, also often referred to as “portable,” emergency response equipment is typically used in locations where there is either no access to water or at highly mobile sites where hazards are mobile. The ANSI/ISEA requirement for this type of equipment is to be visually inspected weekly to determine whether the flushing fluid needs to be exchanged or supplemented (Sections 4.6.3 and others). The units should be maintained as per the manufacturer’s specific model instructions. A majority of self-contained units that use potable water also offer a sterile bacteriostatic additive option to prevent the water from growing bacteria. An exchange of the water and refill of the additive is required every three months for most additive products, as well as rinsing the unit clean between the exchanges. If an additive is not being used, then the water should be exchanged on a weekly basis, at a minimum, with a thorough tank cleaning monthly. On an annual basis, self-contained units are required to undergo the full test just as plumbed units do. The question is often asked whether a company must hire a certified tester to conduct the weekly and annual inspections. Fortunately, there are no prerequisite or certification requirements to be able to test the equipment, although having a complete understanding of the installation and performance requirements will aid in ensuring conformance. There are various training tools, including Online Competent Inspector Training, offered by equipment manufacturers and others for individuals to become subject-matter experts. This allows company personnel to get familiar with what to look for and how to conduct the tests appropriately. Many companies today opt to have an outside third-party inspection performed for them annually, which provides an added measure of credibility and assurance to the review process. 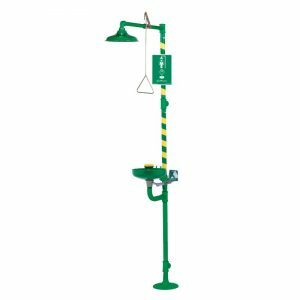 Facilities that contain hundreds of shower and eyewash units should strive to create as many subject-matter experts as possible. Once trained, the weekly checks can be completed rather quickly. Creating facility maps, having full testing kits available, and holding recurring training classes can assist in the tedious yet crucial weekly task. Worker protection should be a priority in every safety plan. Simply providing emergency showers and eyewashes is not enough. It is necessary to inspect, test, and monitor equipment readiness and performance for the optimal response. Did you know Green Guard First Aid & Safety offers First Aid service to help maintain your First Aid Cabinets?